In a perfect world, all cats would have a loving home. Unfortunately, unaltered cats permitted to roam freely either become feral or produce feral offspring. Feral cats are wild and cannot be turned into house pets. When feral cats end up in shelters, they have little hope of coming out alive. Rather than kill feral cats, I promote reducing their population through a process called TNR (trap/neuter/return). For feral cats who find their way into an animal shelter, I propose a “working cat” program to help save their lives by putting them to work in our neighborhoods and ranches. Through a Working Cat Program, feral cats are spayed and neutered and released into areas where they can do what they do best: prevent an overpopulation of rodents. Their reputation as stealthy and successful exterminators is well known and many homeowners and businesses rely on cats as a “green” rat abatement program. Sadly, I was recently helped rescue two dogs exposed to rat poison; one we were able to save, the other succumbed despite our best efforts. One benefit of a Working Cat Program is that it keeps rodents in check without toxic pest control chemicals that are dangerous to pets, wildlife and children. The program also helps improve public health. Rodents carry many diseases including plague, leptospirosis, hantavirus, murine typhus, rat bite fever, salmonella enterica serovar typhimurium, and eosinophilic meningitis. The beauty of working cats is that rodents flee the area when these cats make their presence known. These sleek legends of grace and beauty give off an odor through their paws as they prowl. Once rodents get a whiff of feline, they vacate the premises. Less grisly and more effective than glue traps, cats go about their “work” naturally. They prowl, they eat and they sit in the sun; although they prefer to spend much of their time hiding. Working cats are spayed or neutered so they don’t contribute to the feral cat population. They are vaccinated so they help mitigate cat diseases in our community. They are microchipped so they can be returned to their owner should they end up in a shelter, and they are ear-tipped (under anesthesia while the cats are being altered; veterinarians notch an ear, which is the widely recognized sign that a feral cat is altered). When Working Cats are “employed,” they are transported in large wire cages where they are housed for about a month at their new location. This process is called recolonizing. 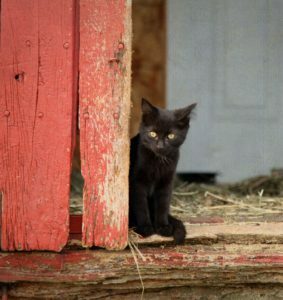 It takes about 30 days for a barn cat to be comfortable enough to consider their new environs home. Local animal shelters should be able to help you colonize your working cat and teach you how to care for them. 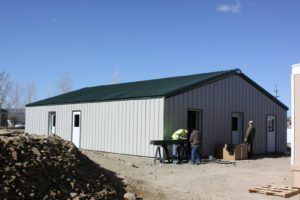 Working cats can be put in any safe area – businesses, hotels, industrial parks, residences, and barns. If you are interested in participating in this cost-effective, humane rat abatement program, call your local shelter to be added to their Working Cat list. Y ou will be contacted when your cat is ready for you. For more information on feral cats visit Developing an Effective Strategy for the Permanent Reduction of Feral Cat Populations. Behind the Yavapai Humane Society’s Pet Adoption Center in Prescott was a large incinerator. Abandoned for several years, the incinerator had become emblematic of a bygone era when homeless pets in our community were euthanized and discarded like so much garbage. 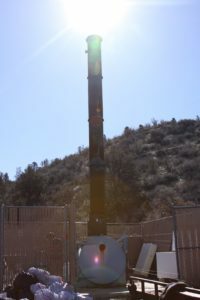 The removal of this nightmarish relic on Feb. 27 is symbolic of a new day for pets in Yavapai County. According to data provided by Animal People, the leading independent newspaper providing investigative coverage of animal protection, central and western Yavapai County is now tied with New York City as the second-safest community in the nation for pets. This ranking is determined by the number of shelter animals killed per 1,000 residents. In the 12 months ending in February, the YHS kill rate fell to an all-time low tied with NYC at 1.0. Whidbey Island, WA is ranked the safest community at .8 pets killed per 1,000 humans. In contrast, Mohave County weighs in at 33. The most dangerous community in the U.S. for shelter animals is Amarillo, Texas, at 54.5 pets killed for every 1,000 residents. In 2009, the YHS kill rate was 10.5, but this rate started declining in July 2010 when the YHS Board of Directors and management team embraced a “no-kill” ethic. This ethic is defined as applying the same criteria to homeless animals that a compassionate veterinarian or loving pet owner would apply to a pet when deciding if or when that pet should be euthanized, meaning only irremediably suffering and dangerously aggressive animals would ever be euthanized. Today, YHS is a national model for having eliminated killing as a method of pet overpopulation control. Reinforcing the symbolic gesture of dismantling the incinerator, YHS is also building an infirmary to care for homeless sick pets. The facility is scheduled to open in May and was made possible thanks to municipal and private funding. This life-saving transformation in our community is the result of YHS supporters, volunteers and donors and could not have been achieved without them. If you would like to achieve No Kill in your community, contact me today.